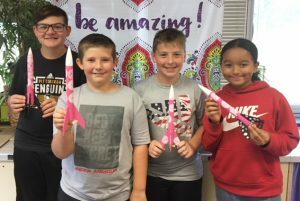 Tyler Bertrand, Tyler Tucker, Logan Patchen, and Tristian Mejia show off their breast cancer awareness rockets, which combined lessons in science and character education. GRANBY – A group of Granby Elementary School sixth graders have completely embodied one of the Fulton City School District’s guiding principles. Tyler Bertrand, Tyler Tucker, Logan Patchen and Tristian Mejia soared to new heights, academically and personally when they banded together to create breast cancer awareness-themed rockets to launch after a classmate, whose mother is a breast cancer survivor, was able to provide them with some of the pink decorations. The Fulton City School District has operated under four basic guiding principles, including the following one, which perfectly fit with the sixth-graders’ hearts: The Fulton City School District shall create a safe, secure and positive learning environment based upon ethical and moral decision and behaviors which foster effective relationships among students, parents and staff. Granby Elementary was the only one of four FCSD elementary schools to launch rockets for the 2018-19 school year, as the lesson was removed with a curriculum shift. Murdoch said Granby sixth grade teachers were able to gather some old rocket kit components and the team of teachers purchased the remaining components needed for students to launch rockets. The rocket lesson has taught students about Newton’s Laws of Motion. All rockets were recently launched during Granby’s open house.